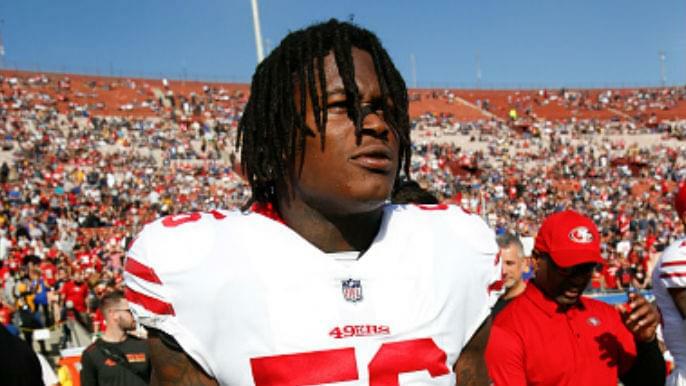 Reuben Foster was arrested for alleged domestic violence involving Elissa Ennis, 28, the same on-again-off-again girlfriend that falsely accused Foster of a similar offense in February. Contrary to the former case, the 49ers did not let due process play out, announcing they would release Foster about nine hours after he was arrested Saturday night in Tampa Bay. Neither John Lynch nor Kyle Shanahan said they knew the specifics of the confrontation, aside from it happening at the Grand Hyatt in Tampa Bay, where the 49ers stayed ahead of their matchup with the Buccaneers. The Tampa police department released the audio of Ennis’ 911 call, pasted below. Ennis said her ex-boyfriend, referring to Foster, took her phone, broke it, and slapped her face. Ennis said Foster left the room to go downstairs. She said she did not need a paramedic. Back in May, Lynch and Shanahan outlined a specific set of guidelines for Foster, which he did not recently follow. The rapid timing of the 49ers’ decision to release Foster indicates the 49ers brass was upset with his lapse in judgment to see Ennis.